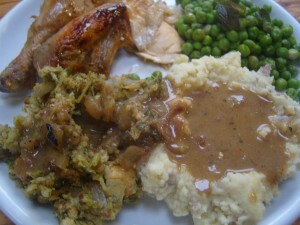 “Green stuffing!” I hear you say. “why ever would I make that”. Thats what I thought the first time I saw it but it is well worth the making. The first time I had it was at my friend Donkeys wedding in a hotel in Louth (dont ask why a girl has a nickname of Donkey- its long and involved using 17 yr old college kid logic-we’ve known each other a loooong time and her real name is Deirdre). 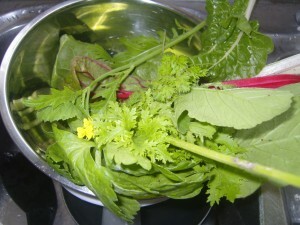 Anyway it was pretty fantastic and so I tried and tried until I achieved a recipe pretty similar and all through the spring and summer, when I have a polytunnel full of soft sweet greens. This is an excellent use of my garden green surplus and is a sneaky way to get extra vegetables into a meal. 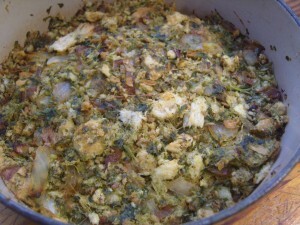 I make this kind of stuffing for my roast chicken but it is a vegitarian recipe and can be made to accompany a range of other foods. It tastes fresh and heathy which masks the fact that you are actually eating a truckload of carbohydrate slathered in gravy. 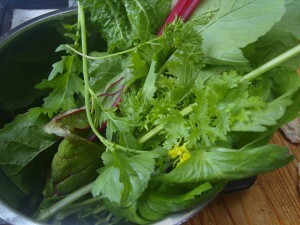 Use any soft green you have growing or can buy like chard ,kale,spinach or salad greens.The greens I used are a mix of kale ,celery leaves, swiss chard,ruby chard, mustard greens and a few stalks of parsley. I also added about 12 leaves of french tarragon for a french twist as the day I took the pictures was Bastille Day but they did make it quite aniseedy so be aware. Ive also made it with basil as the herb ingredient which was quite fantastic.Oregano and parsley are also acceptable as the herbal element. I do have polytunnel bed chock full of sage but didnt use it in the stuffing as it can be quite overpowering and we would have lost the fresh flavour (dont use rosemary,winter savoury or thyme for this either). rougly chop your greens and herbs and whizz up in a food processor or chop very finely by hand- you should end up with about 2 cups of chopped green. 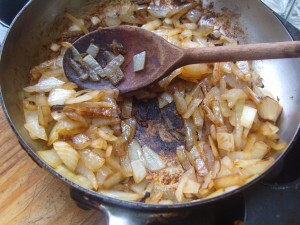 Fry the chopped onions in one of the tablespoons of butter untill they are golden and starting to carmelise and stick to the bottom of the pan (this adds and excellent extra layer of flavour). 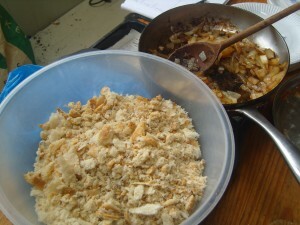 Whizz up your bread until it is in large crumbs. 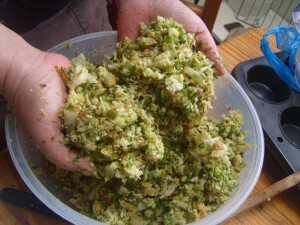 Mix the greens,breadcrumbs and onion together by hand. Grab a piece and taste it and add enough salt and pepperfor your taste-add more greens or herbs at this point if you like and pat into a buttered casserole dish. 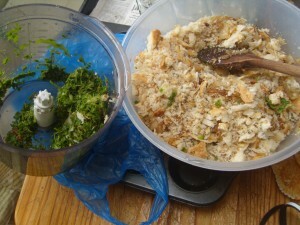 (We always cook our stuffing seperate to our birds to decrease cooking times and prevent the bird from being underdone in the middle). Dab the remaining butter on top and bake uncovered at 200deg for approx 30 mins.Check if its golden on top and if not- try 5 more minutes . Remove from oven and let cool for a few minutes and then scoop it out and slather it with gravy- Divine! 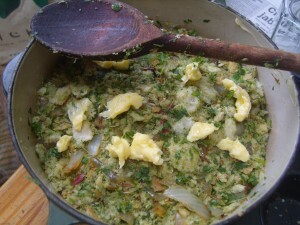 I like my stuffing chunky but if you like a finer texture make your breadcrumbs onions andherbs finer before mixing together. 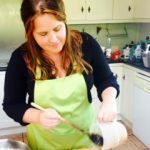 As I said -We usually eat this with chicken but it would accompany pork or duck well and as its a vegetarian recipe you can make it for your vegetarian friends with a nut roast and they’ll feel you made an extra effort for them. substitute olive oil for the butterin the recipe and it becomes vegan. Optional extras-My son feels that the addition of cooked bacon lardons and bacon fat to the stuffing would make it truly sublime.